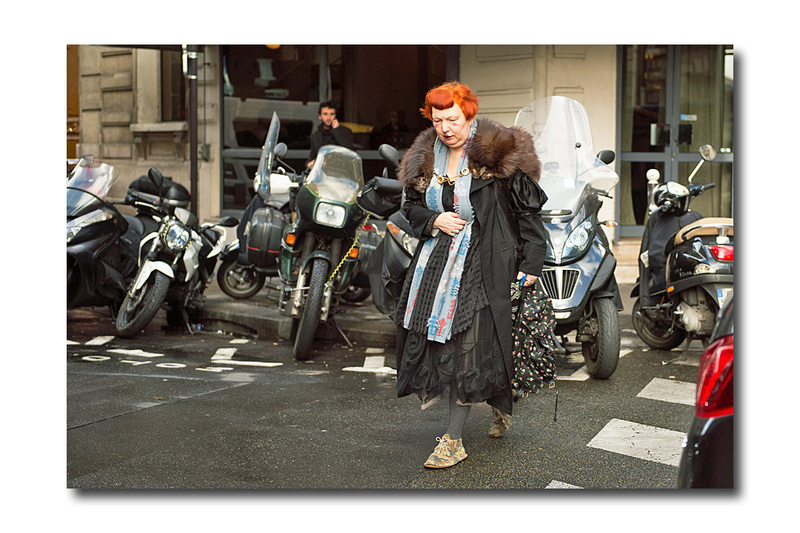 Lynn Yaeger’s unwavering idiosyncratic personal style is nothing if not attention grabbing, but it’s generated more attention as of late. The eccentric fashion writer was even the subject of a recent article written by Matthew Schneier in the Thursday Styles section of The New York Times (“The Muse in The 2nd Row”). Now, I don’t mean to steal Ms. Yaeger’s thunder, but the way I see, it, there’s another instantly recognizable fashion muse in town, and she’s practically twice her age. Of course I’m referring to 94 year old Iris Apfel, and she has managed to do the almost unimaginable; she has remained a fixture in a youth obsessed industry. And that’s no small feat. 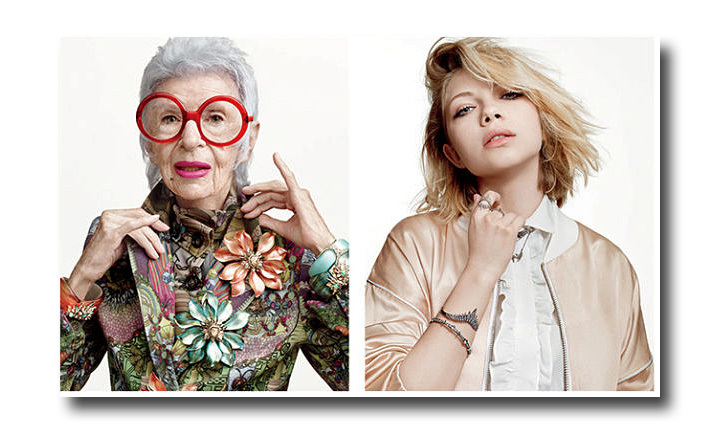 While there are signs that things might be slowly getting better, let’s face it; the fashion world is still age phobic. Sure there have been vestiges of Lynn at the Fall/Winter 2016/17 collections. There was her flaming red bob worn by “Lynnalike model” Katie Moore (who opened Alexander Wang’s show and appeared at Moschino, Margiela, and Balenciaga in Paris). And her unabashed love of oversized proportions, her signature layering, and ever present petti coated balloon skirts, have been spotted on the runways of Marc Jacobs, Undercover, and Chloe. 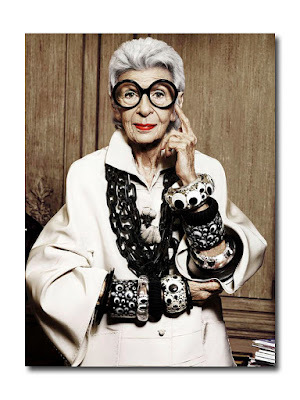 But it’s impossible for me to look at images of Iris (the ultimate rule breaker), and not connect the dots between her irreverent, eccentric, more is more, individual style, and the current maxed out mood that has all but taken over fashion. 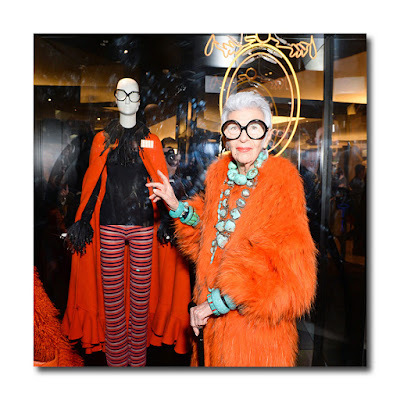 The cover lines gracing Bergdorf Goodman’s spring 2016 collections magazine says it all, “Exuberant Eclecticism” and those two words perfectly sum up Iris’s style. In fact, there have been bits and pieces of Iris all over recent runways (not the least of which is Alessandro Michele’s Gucci): her love of the exotic and the surreal, the irreverent mixes, her exuberant use of color, her statement making spectacles, her piled on costume jewelry (which includes figures of birds, snakes, frogs, owls), her predilection for wild, colorful long haired furs (like Mongolian lamb), and her penchant for upholstery fabrics. Well, she did co-found the famed textile company Old World Weavers with her late husband Carl who passed away last summer just shy of his 101st birthday. (Jacqueline Kennedy, during her time as First Lady, was just one of her high profile customers). 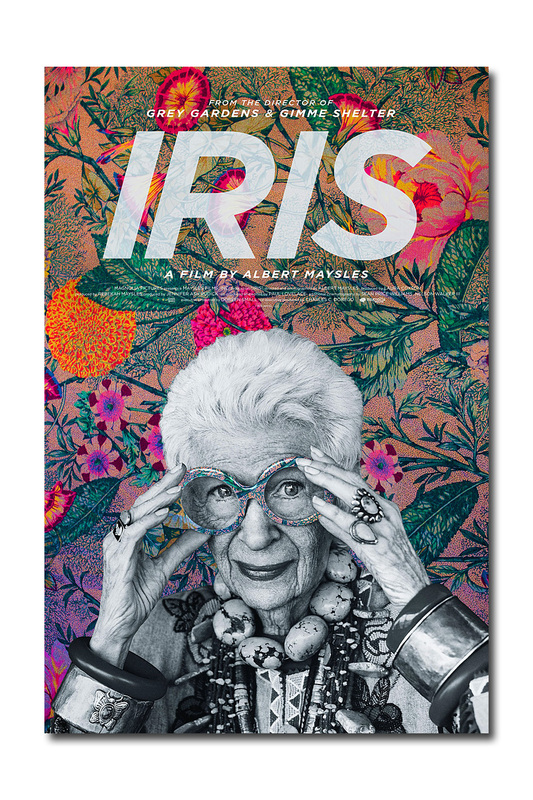 She didn’t become the star of her own documentary (“Iris”, by the late Albert Maysles) nor did she garner an exhibition at the Met’s Costume Institute for nothing. “Rara Avis”: The Irreverent Style of Iris Barrel Apfel, which opened in September 2005, was a game changer and served as inspiration for me and many others (including fashion designers). Rare bird indeed! There is no one else like her. Depending on your age, you may or may not remember the slogan for a hair product, Loving Care, back in 1971: “You’re not getting older, you’re getting better!” Well, the tireless self-proclaimed “geriatric star” is not only getting better, she’s becoming more inspired and more creative. 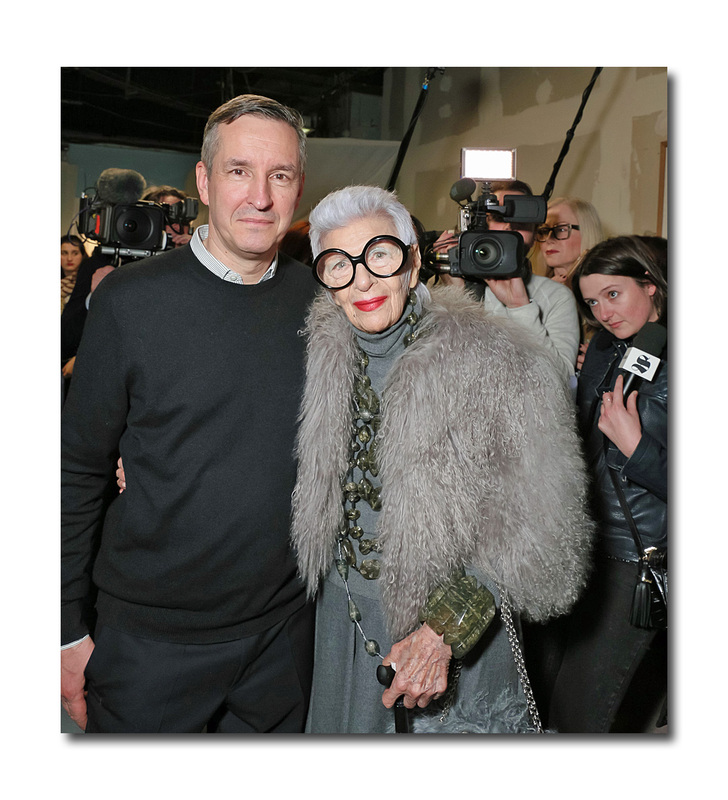 At the age of 90, she became a visiting professor at the University of Texas at Austin; she’s had a number of design collaborations (HSN, Eyebobs, Loehmann’s), and in fact, while she may not be a traditional beauty, she has become a highly sought after model. 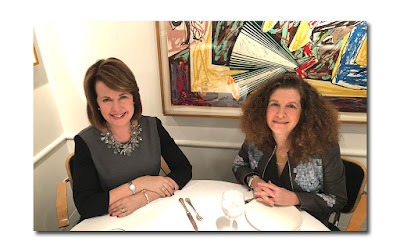 She never tires of recalling the time (about 70 years ago), that Mrs. Loehmann, proprietress of the Brooklyn department store Loehmann’s, told her: “You’ll never be pretty, but it doesn’t matter, you have something much better. You have style”. 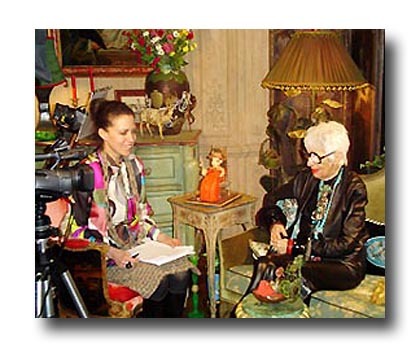 “Iris Apfel Hits Paris” (Iris Apfel went to Paris Fashion Week, and quite honestly, the city may never be the same), www.nytimes.com “Inside Iris Apfel’s (Very, Very Busy) Week, www.nytimes.com “The Real Star of Fashion Week is Iris Apfel”, www.straitstimes.com. “Paris fashion bows before ‘geriatric starlet’ Iris Apfel, 94. Move over models of the moment Gigi Hadid and Kendall Jenner. 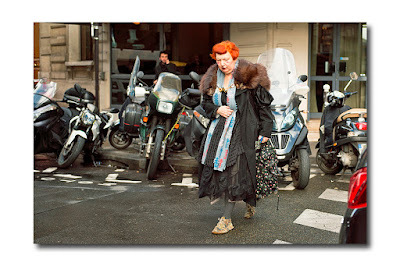 The real star of Paris fashion week is a wise-cracking 94-year-old New Yorker”. 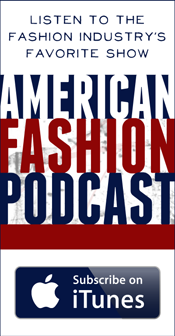 AFP via yahoo.com and “Iris Apfel Takes Fashion Week”, www.wmagazine.com. Even though she needed the occasional aid of a wheelchair, she refused to slow down. As W magazine pointed out, “She does more in a week than women half her age. Or a quarter. Or a tenth.” I was exhausted just reading about her activities. She sat front row at Dries Van Noten, Rick Owens, and Christian Dior; attended a reception in her honor at Le Bon Marche which celebrated a fashion exhibition and pop up store featuring pieces inspired by her personal style (the collection is called “Iris in Paris”); Azzedine Alaia cooked her dinner at his headquarters; she went vintage shopping with London based designer Duro Olowu; she visited Karl Lagerfeld’s personal library; attended a luncheon at the United States Embassy for the United Nations Foundation, in honor of International Women’s Day, and had lunch with good friends Marisa Berenson and Linda Fargo.